In today's internet driven world, seniors and their parents expect a modern approach to managing your relationship with them. They willingly provide email addresses and mobile phone numbers and they reward you when you use them to make life easier! Mobile phones create new opportunities to engage with seniors. Using SMS to notify and link them to their online gallery has tremendous power. Delivering proofs and selected poses directly to those devices can help generate new revenue and drive viral activity. 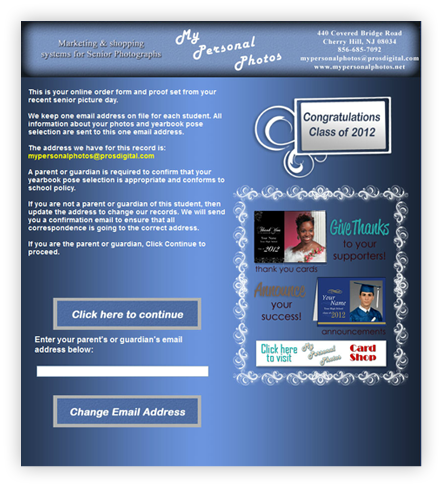 Portrait personalized email messaging delivers high response rates without the expense of printing and mailing proofs. 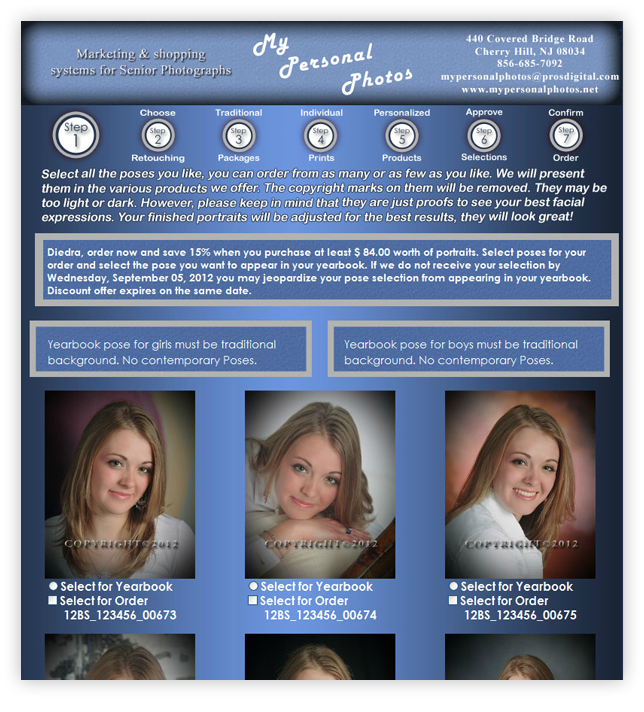 Connecting with and delivering portraits to social media sites is a great reward for ordering and a useful tool to connect friends and family to your storefront. Analytics drive automated production and delivery of QR code printed post cards only to customers who have not responded to email and text messaging. to the right customers at the right time. This specialized marketing system was developed over the last two years in conjuction with the largest senior photography business in the new york city metropolitan area. More than 60,000 students and parents have used the system. 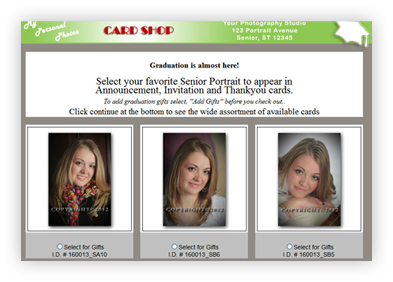 Graduating seniors have a unique relationship with portraits. Years of education and the promise of a bright future create a strong desire to share accomplishments and memories. 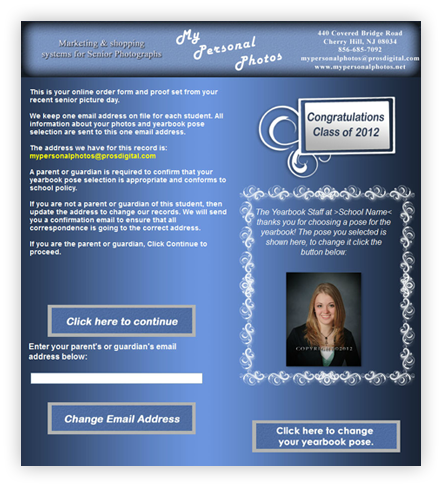 The "senior portrait photographer" is in a unique position to commemorate this "once in a lifetime" achievement. A professionally created "Senior Portrait" presents the senior at their best. 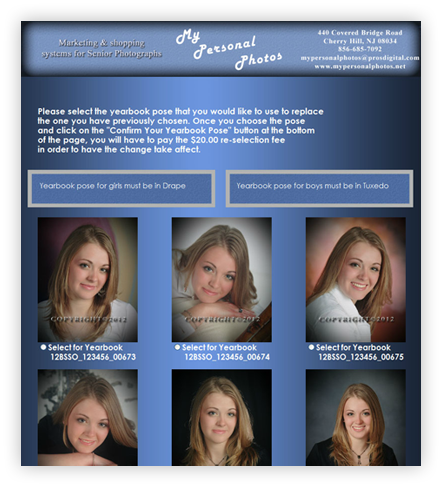 Senior portraits taken early provide opportunities throughout the graduating year timeline. A well executed portrait marketing program should leverage your relationship along this timeline to make new connections with seniors that ultimately lead to higher student engagement and more portrait photography sales. 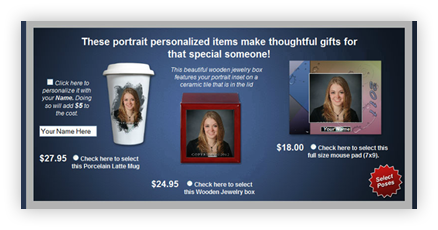 There was a time when a high percentage of students were purchasing portraits. With the advent of inexpensive digital cameras and their evolution into todays smart phones, pictures and social sharing have become the norm. The reality for photography businesses is fewer customers buy portraits! These facts have forever altered the business model for senior photographers. 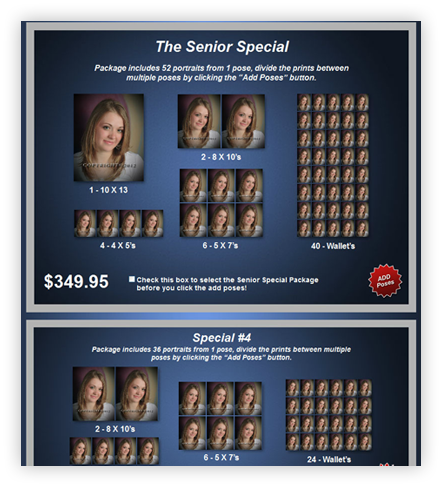 The majority of seniors get their portraits taken so they can be in the school's yearbook. These subjects want to view and choose their yearbook portrait online. We've proven that they will pay significantly higher sitting fees for the opportunity. The new business model for senior photographers includes a 2 tier sitting fee that makes it possible for those paying the higher fee to do just that while ensuring that it's still profitable to provide these services. These facts and the realities of the business mean that it doesn't make sense to endure the labor and material costs associated with producing proofs and mailing them to customers. 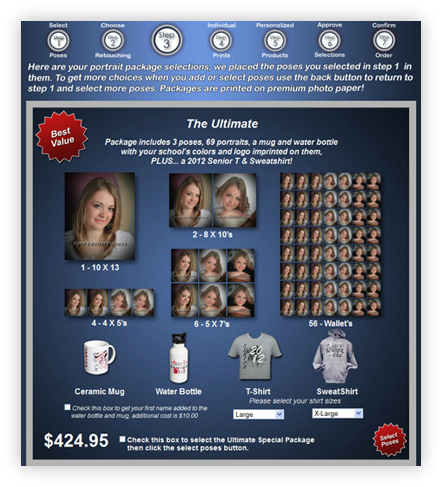 This fully automated marketing system drives a higher percentage of customers to your integrated online storefront and ultimately more customers purchase portraits! Retake poses added to original poses in online store. 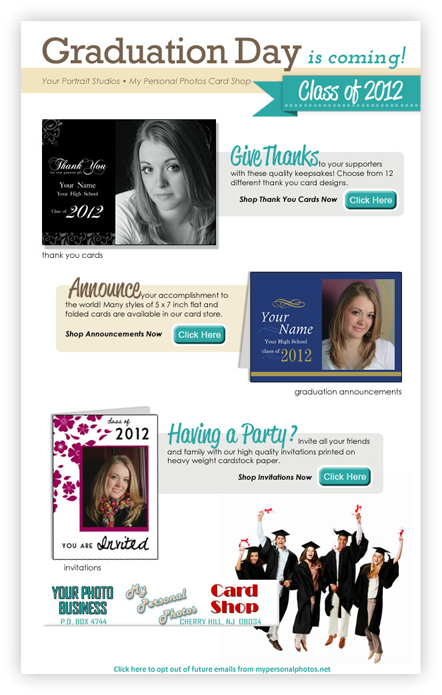 Customize emails with your studio logo, colors and messaging! Action messages vary depending on where in the timeline your relationship is and can be triggered by your customers online activity. Your senior's have a limited amount of time to take advantage of your offer and only if they spend the amount you want. 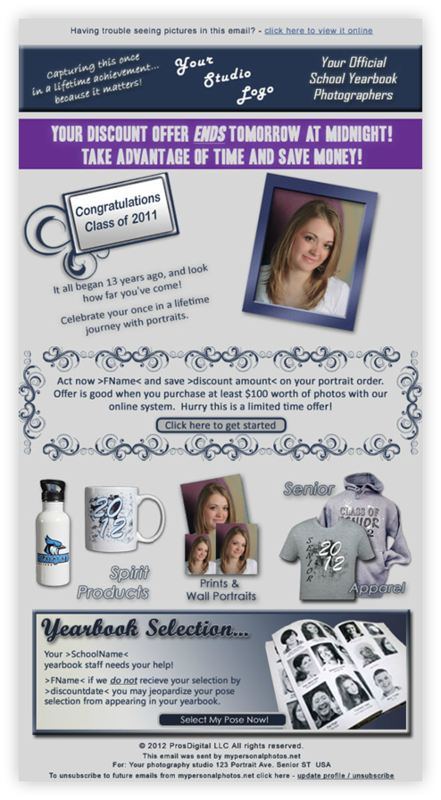 Show off more products by featuring your senior in them! Customize your online store with a studio logo, colors and messaging! 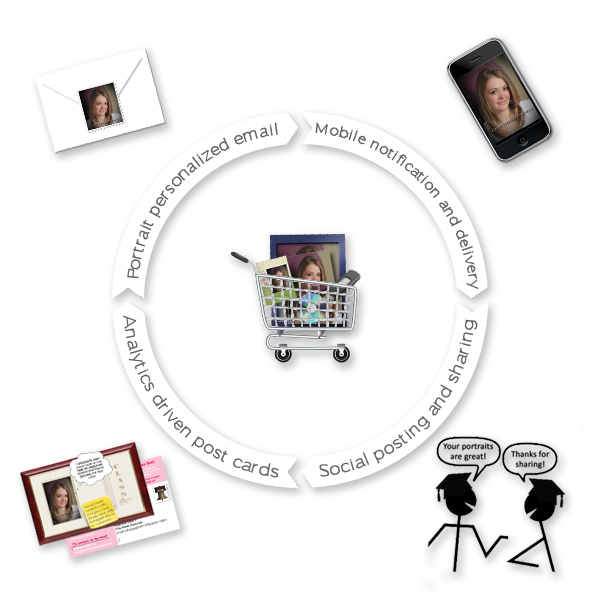 Personalized messaging that varies depending on timeline and online activity. Seven simple steps to complete an order with all the trimmings. Yearbook selection instructions for boys and girls that can vary by school and goes away after a selection is made. Lots of room for as many poses as you have, including retakes. Rendered with your copyright marks, right click copy disabled and that won't print from the browser command. Make many selections for orders and only one for the yearbook, you can't continue if you don't, we tell you if something is wrong. Multipose packages are presented with the right number of poses split correctly into units. Selecting or adding poses opens a new page where poses are easily assigned to package units. Print sizes are scaled to be proportional and match aspect ratios. 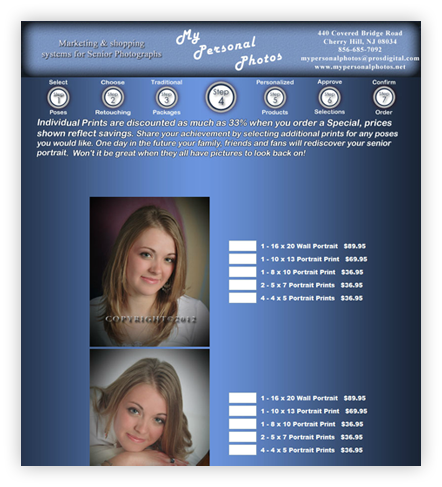 Individual print prices vary based on whether or not a package was purchased. Bonus wallets, personalized, die cut and in popular quantities from the pose you select and only if a package is part of the order. 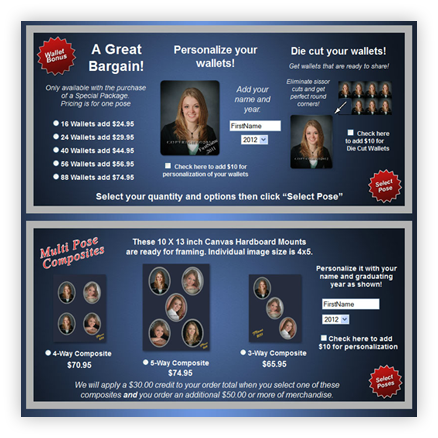 Conditional pricing and easy pose selection for your composites! 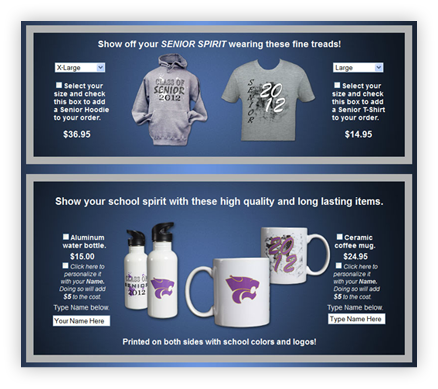 School spirit products can be personalized with school logos, colors & portraits! The whole yearbook pose selection process is fraught with opportunities for mistakes. This system instructs seniors on required poses for each individual school. It also prevents selections when the deadline date has passed. To reduce the level of complication the system keeps track of selections and can generate reports by school and date range. 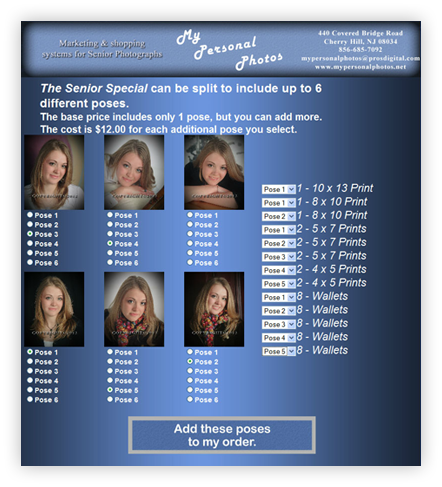 It can also require payment when seniors change their minds about which pose they want to appear in the yearbook. 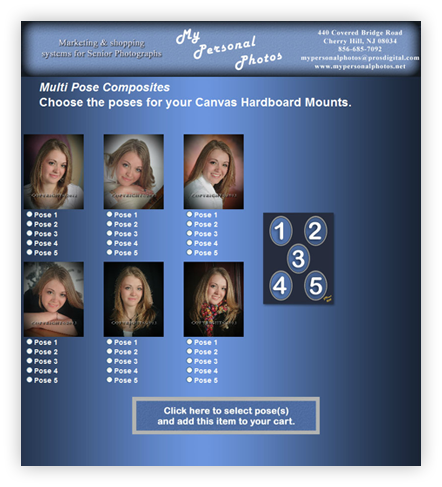 Yearbook pose selections displayed with a simple reselection process that collects the fee you charge for doing it. 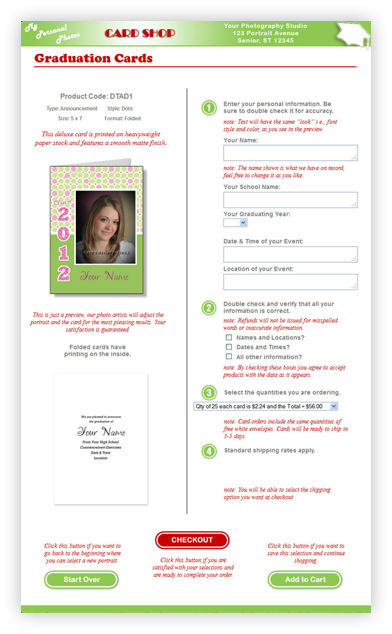 Graduation card promotion starts in February and runs through July with these portriat personalized emails. Seasonal promotion of cards inspires more customers to explore and purchase cards. 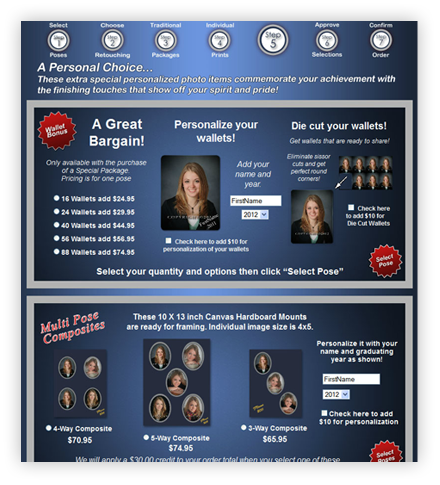 Clicking through on the email lands the customer on the pose selection page. 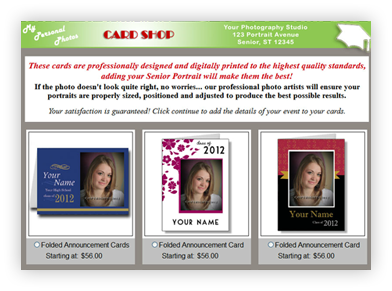 Chosing a pose to print on the card delivers customer to a wide assortment of available portrait cards. After selecting a card customers preview and enter details to complete their order.